The UNO Education Press began as a part of an International Red Cross effort in the early 1980s, printing and copying documents for Afghan refugees in Peshawar, Pakistan. Since the 1980s, the press's clients have included Afghan ministries, especially the Ministry of Education, President Karzai's office, the U.S. Embassy, the U.S. base at Bagram, UN offices, international and Afghan NGOs, and private entities. The UNO Education Press was chosen to print the new Afghan Constitution and the ballots for the first democratic elections in Afghanistan in 35 years. The Kabul Press serves Afghanistan's education system and offers employment opportunities for local Afghans. Afghan women bind and package books in March 2006 at Kabul Press. 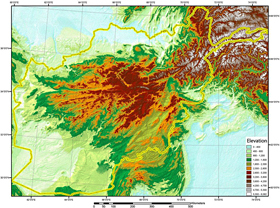 Working with faculty from the university's Department of Geography/Geology, the Center has studied the landforms and geomorphology of Afghanistan and Central Asia by analyzing satellite imagery and sending researchers into the region's mountain ranges. Click the arrow below to learn more about the Center's geography and geology research.